What really happened that led to the detention of a 22-year-old Army private as the WikiLeaks whistle-blower? On June 6, Kevin Poulsen and Kim Zetter of Wired reported that a 22-year-old U.S. Army Private in Iraq, Bradley Manning, had been detained after he "boasted" in an Internet chat -- with convicted computer hacker Adrian Lamo -- of leaking to WikiLeaks the now famous Apache Helicopter attack video, a yet-to-be-published video of a civilian-killing air attack in Afghanistan, and "hundreds of thousands of classified State Department records." Lamo, who holds himself out as a "journalist" and told Manning he was one, acted instead as government informant, notifying federal authorities of what Manning allegedly told him, and then proceeded to question Manning for days as he met with federal agents, leading to Manning's detention. On June 10, former New York Times reporter Philip Shenon, writing in The Daily Beast, gave voice to anonymous "American officials" to announce that "Pentagon investigators" were trying "to determine the whereabouts of the Australian-born founder of the secretive website Wikileaks [Julian Assange] for fear that he may be about to publish a huge cache of classified State Department cables that, if made public, could do serious damage to national security." Some news outlets used that report to declare that there was a "Pentagon manhunt" underway for Assange -- as though he's some sort of dangerous fugitive. From the start, this whole story was quite strange for numerous reasons. In an attempt to obtain greater clarity about what really happened here, I've spent the last week reviewing everything I could related to this case and speaking with several of the key participants (including Lamo, with whom I had a one-hour interview last night that can be heard on the recorder below, and Poulsen, with whom I had a lengthy email exchange, which is published in full here). A definitive understanding of what really happened is virtually impossible to acquire, largely because almost everything that is known comes from a single, extremely untrustworthy source: Lamo himself. Compounding that is the fact that most of what came from Lamo has been filtered through a single journalist -- Poulsen -- who has a long and strange history with Lamo, who continues to possess but not disclose key evidence, and who has been only marginally transparent about what actually happened here (I say that as someone who admires Poulsen's work as Editor of Wired's Threat Level blog). In other words, exactly what the U.S. Government wanted to happen in order to destroy WikiLeaks has happened here: news reports that a key WikiLeaks source has been identified and arrested, followed by announcements from anonymous government officials that there is now a worldwide "manhunt" for its Editor-in-Chief. Even though WikiLeaks did absolutely nothing (either in this case or ever) to compromise the identity of its source, isn't it easy to see how these screeching media reports -- WikiLeaks source arrested; worldwide manhunt for WikiLeaks; major national security threat -- would cause a prospective leaker to WikiLeaks to think twice, at least: exactly as the Pentagon Report sought to achieve? And that Pentagon Report was from 2008, before the Apache Video was released; imagine how intensified is the Pentagon's desire to destroy WikiLeaks now. Combine that with what both the NYT and Newsweek recently realized is the Obama administration's unprecedented war on whistle-blowers, and one can't overstate the caution that's merited here before assuming one knows what happened. Adrian Lamo and Kevin Poulsen have a long and strange history together. 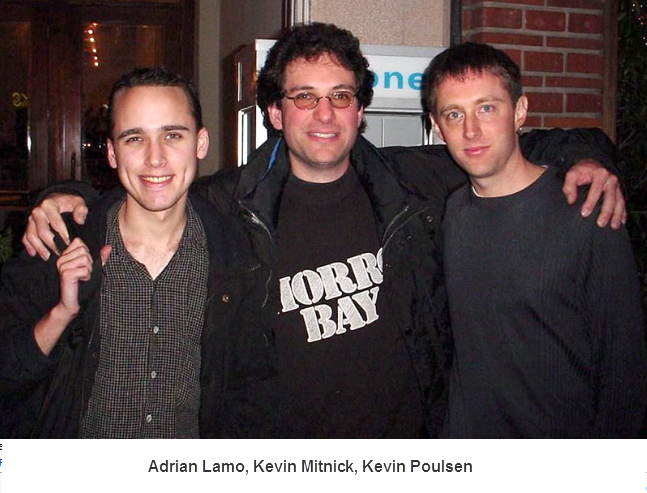 Both were convicted of felonies relating to computer hacking: Poulsen in 1994 (when he was sentenced to 3 1/2 years in prison, ironically because a friend turned government informant on him), and Lamo in 2004 for hacking into The New York Times. When the U.S. Government was investigating Lamo in 2003, they subpoenaed news agencies for any documents reflecting conversations not only with Lamo, but also with Poulsen. That's because Lamo typically sought media publicity after his hacking adventures, and almost always used Poulsen to provide that publicity. Despite being convicted of serious hacking felonies, Poulsen was allowed by the U.S. Government to become a journalist covering the hacking world for Security Focus News. Back in 2002, Information Week described the strange Lamo-Poulsen relationship this way: "To publicize his work, [Lamo] often tapped ex-hacker-turned-journalist Kevin Poulsen as his go-between: Poulsen contacts the hacked company, alerts it to the break-in, offers Lamo's cooperation, then reports the hack on the SecurityFocus Online Web site, where he's a news editor." When Lamo hacked into the NYT, it was Poulsen who notified the newspaper's executives on Lamo's behalf, and then wrote about it afterward. Poulsen told me that the above picture was taken at a lunch the two of them had together with convicted hacker Kevin Mitnick back in 2001. When I asked Poulsen if he considers Lamo his friend, he would respond only by saying: "He's a subject and a source." Actually, over the years, Poulsen has served more or less as Lamo's personal media voice. Back in 2000, Poulsen would quote Lamo as an expert source on hacking. That same year, Poulsen -- armed with exclusive, inside information from Lamo -- began writing about Lamo's various hacking adventures. After Lamo's conviction, Poulsen wrote about his post-detention battles with law enforcement and a leaked documentary featuring Lamo. As detailed below, Lamo is notorious in the world of hacking for being a low-level, inconsequential hacker with an insatiable need for self-promotion and media attention, and for the past decade, it has been Poulsen who satisfies that need. On May 20 -- a month ago -- Poulsen, out of nowhere, despite Lamo's not having been in the news for years, wrote a long, detailed Wired article describing serious mental health problems Lamo was experiencing. The story Poulsen wrote goes as follows: after Lamo's backpack containing pharmaceutical products was stolen sometime in April (Lamo claims they were prescribed anti-depressants), Lamo called the police, who concluded that he was experiencing such acute psychiatric distress that they had him involuntarily committed to a mental hospital for three days. That 72-hour "involuntary psychiatric hold" was then extended by a court for six more days, after which he was released to his parents' home. Lamo claimed he was diagnosed with Asperger's Syndrome, a somewhat fashionable autism diagnosis which many stars in the computer world have also claimed. In that article, Poulsen also summarized Lamo's extensive hacking history. Lamo told me that, while he was in the mental hospital, he called Poulsen to tell him what happened, and then told Poulsen he could write about it for a Wired article. So starved was Lamo for some media attention that he was willing to encourage Poulsen to write about his claimed psychiatric problems if it meant an article in Wired that mentioned his name. It was just over two weeks after writing about Lamo's Asperger's, depression and hacking history that Poulsen, along with Kim Zetter, reported that PFC Manning had been detained, after, they said, he had "contacted former hacker Adrian Lamo late last month over instant messenger and e-mail." Lamo told me that Manning first emailed him on May 20 and, according to highly edited chat logs released by Wired, had his first online chat with Manning on May 21; in other words, Manning first contacted Lamo the very day that Poulsen's Wired article on Lamo's involuntary commitment appeared (the Wired article is time-stamped 5:46 p.m. on May 20). Lamo, however, told me that Manning found him not from the Wired article -- which Manning never mentioned reading -- but from searching the word "WikiLeaks" on Twitter, which led him to a tweet Lamo had written that included the word "WikiLeaks." Even if Manning had really found Lamo through a Twitter search for "WikiLeaks," Lamo could not explain why Manning focused on him, rather than the thousands of other people who have also mentioned the word "WikiLeaks" on Twitter, including countless people who have done so by expressing support for WikiLeaks. Although none of the Wired articles ever mention this, the first Lamo-Manning communications were not actually via chat. Instead, Lamo told me that Manning first sent him a series of encrypted emails which Lamo was unable to decrypt because Manning "encrypted it to an outdated PGP key of mine" [PGP is an encryption program]. After receiving this first set of emails, Lamo says he replied -- despite not knowing who these emails were from or what they were about -- by inviting the emailer to chat with him on AOL IM, and provided his screen name to do so. Lamo says that Manning thereafter sent him additional emails encrypted to his current PGP key, but that Lamo never bothered to decrypt them. Instead, Lamo claims he turned over all those Manning emails to the FBI without ever reading a single one of them. Thus, the actual initial communications between Manning and Lamo -- what preceded and led to their chat -- are completely unknown. Lamo refuses to release the emails or chats other than the small chat snippets published by Wired. Using the chat logs between Lamo and Manning -- which Lamo provided to Poulsen -- the Wired writers speculated that the Army Private trusted Lamo because he "sensed a kindred spirit in the ex-hacker." Poulsen and Zetter write that Manning confessed to being the leaker of the Apache attack video "very quickly in the exchange," and then proceeded to boast that, in addition, "he leaked a quarter-million classified embassy cables" to WikiLeaks. Very shortly after the first chat, Lamo notified federal agents of what Manning told him, proceeded to speak to Manning for the next several days while consulting with federal agents, and then learned that Manning was detained in Iraq. Many of the bizarre aspects of this case, at least as conveyed by Lamo and Wired, are self-evident. Why would a 22-year-old Private in Iraq have unfettered access to 250,000 pages of diplomatic cables so sensitive that they "could do serious damage to national security?" Why would he contact a total stranger, whom he randomly found from a Twitter search, in order to "quickly" confess to acts that he knew could send him to prison for a very long time, perhaps his whole life? And why would he choose to confess over the Internet, in an unsecured, international AOL IM chat, given the obvious ease with which that could be preserved, intercepted or otherwise surveilled? These are the actions of someone either unbelievably reckless or actually eager to be caught. All that said, this series of events isn't completely implausible. It's possible that a 22-year-old who engaged in these kinds of significant leaks, sitting in isolation in Iraq, would have a desire to unburden himself by confessing to a stranger; the psychological compulsion to confess is not uncommon (see Crime and Punishment), nor is the desire to boast of such acts. It's possible that he would have expected someone with Lamo's hacking and "journalist" background to be sympathetic to what he did and/or to feel compelled as a journalist not to run to the Government and disclose what he learns from a source. Still, the apparent ease with which Manning quickly spilled his guts in such painstaking detail over an Internet chat concerning such serious crimes -- and then proceeded to respond to Lamo's very specific and probing interrogations over days without ever once worrying that he could not trust Lamo -- is strange in the extreme. If one assumes that this happened as the Wired version claims, what Lamo did here is despicable. He holds himself out as an "award-winning journalist" and told Manning he was one ("I did tell him that I worked as a journalist," Lamo said). Indeed, Lamo told me (though it doesn't appear in the chat logs published by Wired) that he told Manning early on that he was a journalist and thus could offer him confidentiality for everything they discussed under California's shield law. Lamo also said he told Manning that he was an ordained minister and could treat Manning's talk as a confession, which would then compel Lamo under the law to keep their discussions confidential (early on in their chats, Manning said: "I can't believe what I'm confessing to you"). In sum, Lamo explicitly led Manning to believe he could trust him and that their discussions would be confidential -- perhaps legally required to be kept confidential -- only to then report everything Manning said to the Government. Worse, Lamo breached his own confidentiality commitments and turned informant without having the slightest indication that Manning had done anything to harm national security. Indeed, Lamo acknowledged to me that he was incapable of identifying a single fact contained in any documents leaked by Manning that would harm national security. And Manning's capacity to leak in the future was likely non-existent given that he told Lamo right away that he was "pending discharge" for "adjustment disorder," and no longer had access to any documents (Lamo: "Why does your job afford you access?" - Manning: "because i have a workstation . . . *had*"). Manning: well, it was forwarded to [WikiLeaks] - and god knows what happens now - hopefully worldwide discussion, debates, and reforms - if not, than [sic] we're doomed - as a species - i will officially give up on the society we have if nothing happens - the reaction to the video gave me immense hope; CNN's iReport was overwhelmed; Twitter exploded - people who saw, knew there was something wrong . . . - i want people to see the truth… regardless of who they are… because without information, you cannot make informed decisions as a public. That's a whistleblower in the purest form: discovering government secrets of criminal and corrupt acts and then publicizing them to the world not for profit, not to give other nations an edge, but to trigger "worldwide discussion, debates, and reforms." That's the person that Adrian Lamo informed on and risked sending to prison for an extremely long time. Making Lamo's conduct even worse is that it appears he reported Manning for no reason other than a desire for some trivial media attention. Jacob Appelbaum, a well-known hacker of the Tor Project who has known Lamo for years, said that Lamo's "only concern" has always been "getting publicity for Adrian." Indeed, Lamo's modus operandi as a hacker was primitive hacking aimed at high-profile companies that he'd then use Poulsen to publicize. As Appelbaum put it: "if this situation really fell into Adrian's lap, his first and only thought would have been: how can I turn this to my advantage? He basically destroyed a 22-year-old's life in order to get his name mentioned on the Wired.com blog." [There are efforts underway to help secure very competent legal counsel for Manning, including a legal defense fund for him; assuming the facts are what the current narrative suggests, I intend to post more about that shortly]. None of Lamo's claims that he turned informant out of some grave concern for "national security" and "the lives of his fellow citizens" make any sense. Indeed, Lamo several months ago contributed $30 to WikiLeaks, which he's use to tout his support for whistle-blowing, and told me has has long considered himself on "the far left." Yet in the public statements he's made about what he did to Manning, he's incoherently invoked a slew of trite, right-wing justifications, denouncing Manning as a "traitor" and a "spy," while darkly insinuating that Manning provided classified information to a so-called "foreign national," meaning WikiLeaks' Assange. Lamo told me that any embarrassment to the U.S. Government could cause a loss of American lives, and that he believes anyone who breaks the law with leaks should be prosecuted. Yet he also claims to support WikiLeaks, which is run by that very same "foreign national" and which exists to enable illegal leaks. Then there's the fact that, just in the last two weeks, Lamo's statements have been filled with countless contradictions of the type that suggests deliberate lying. Lamo told me, for instance, that Manning first contacted him with a series of emails, but told Yahoo! News that "Manning contacted him via AOL Instant Messenger 'out of the blue' on May 21." Lamo told Yahoo! "that he spelled out very clearly in his chats with Manning that he wasn't ... acting as a journalist," that it "was clear to Manning that he had taken his journalist hat off for the purposes of their conversation," and that "Manning refused" a confidentiality offer, but last night he said to me that he told Manning their conversations would have journalist-source confidentiality and that Manning never refused or rejected that. Just listen to the interview Lamo gave to me and make your own judgment about his veracity. Adrian reached out to me in late May to tell me a story about how he'd been contacted by an Army intelligence analyst who'd admitted to leaking 260,000 State Department diplomatic cables to a "foreign national." Adrian told me he had already reported the matter to the government, and was meeting the Army and FBI in person to pass on chat logs. He declined to provide independently verifiable details, or identify the intelligence analyst by name, because he said he considered the matter sensitive. Several days passed before he was willing to give me the chat logs under embargo. I got them on May 27. That's when I learned Manning's name and the full details of his claims to Adrian. . . . If you're asking if I informed on Manning or anyone else, the answer is no, and the question is insulting. This part of Wired's conduct deserves a lot more attention. First, in his interview with me, Lamo claimed that all sorts of things took place in the discussion between him and Manning that are (a) extremely relevant to what happened, (b) have nothing to do with Manning's personal issues or sensitive national security secrets, and yet (c) are nowhere to be found in the chat logs published by Wired. That means either that Lamo is lying about what was said or Wired is concealing highly relevant aspects of their discussions. Included among that is Manning's explanation about how he found Lamo and why he contacted him, Manning's alleged claim that his "intention was to cripple the United States' foreign relations for the foreseeable future," and discussions they had about the capacity in which they were speaking. Second, one can't help but note the irony that two hackers-turned-journalists -- Poulsen and Lamo -- are now the self-anointed guardians of America's national security, the former concealing secrets he learned as a journalist on vague national security grounds and the latter turning informant by invoking the most extreme, right-wing platitudes about "traitors" and "spies" and decrees that his actions were necessary to "save American lives." Third, Wired should either publish all of the chat logs, or be far more diligent about withholding only those parts which truly pertain only to Manning's private and personal matters and/or which would reveal national security secrets. Or they should have a respected third party review the parts they have concealed to determine if there is any justification for that. At least if one believes Lamo's claims, there are clearly relevant parts of those chats which Wired continues to conceal. Given Poulsen's mutually beneficial and multi-layered relationship with Lamo, they have far more than a standard journalist-source relationship. None of Poulsen's articles about the highly controversial Lamo is ever even remotely critical of him, in any sense of the word. From the start, there were countless bizarre aspects to Lamo's story which Poulsen never examined or explored, at least not when writing about any of this. I see no reason to doubt Poulsen's integrity or good faith. Still, in light of the magnitude of this story on several levels and his long relationship with Lamo, Kevin Poulsen should not be single-handedly deciding what the public is and isn't permitted to know about the Lamo-Manning interaction. The reason this story matters so much -- aside from the fact that it may be the case that a truly heroic, 22-year-old whistle-blower is facing an extremely lengthy prison term -- is the unique and incomparably valuable function WikiLeaks is fulfilling. Even before the Apache helicopter leak, I wrote at length about why they are so vital, and won't repeat all of that here. Suffice to say, there are very few entities, if there are any, which pose as much of a threat to the ability of governmental and corporate elites to shroud their corrupt conduct behind an extreme wall of secrecy. What makes WikiLeaks particularly threatening to the most powerful factions is that they cannot control it. Even when whistle-blowers in the past have leaked serious corruption and criminal conduct to perfectly good journalists at the nation's largest corporate media outlets, government officials could control how the information was disclosed. When the NYT learned in 2004 that the Bush administration was illegally eavesdropping on Americans without warrants, George Bush summoned the paper's Publisher and Executive Editor to the Oval Office, demanded that the story not be published, and the paper complied by sitting on it for a full year until after Bush was safely re-elected. When The Washington Post's Dana Priest learned that the CIA was maintaining a network of secret prisons -- black sites -- she honored the request of "senior U.S. officials" not to identify the countries where those prisons were located so as to not disrupt the U.S.'s ability to continue to use those countries for such projects. Both WikiLeaks and Manning have stated that The Washington Post's David Finkel, when writing his book on Iraq two years ago, had possession of the Apache helicopter video but never released it to the public (Manning: "Washington Post sat on the video … David Finkel acquired a copy while embedded out here"). As Columbia Journalism Review reported, both the Post and Finkel were quite coy and evasive in addressing that claim, pointedly insisting that "the Post" had never possessed that video while refusing to say whether Finkel did. The same thing happened when, on the same day, I called Finkel to ask him about WikiLeaks' claim that they possessed but never released that video. He very curtly told me, using careful legalistic language, that "the Post never had the video," but before I could ask whether Finkel himself did, he abruptly told me he couldn't talk anymore and had nothing else to say, and then hung up on me. My inquiries to the Post were met with a pro forma response that "The Washington Post did not have the video, nor did we sit on anything," but these Journalistic Crusaders for Transparency refused to answer my question as to whether Finkel himself did. By stark contrast, WikiLeaks isn't interested in helping governments, militaries and corporations keep secrets. They're interested in the opposite: forcing transparency on institutions which conduct the vast, vast bulk of their substantive conduct in the dark. They're not susceptible to pressure from political and corporate officials; rather, they want to hold them accountable. That's what makes WikiLeaks so uniquely threatening to elite institutions, and anyone who doubts that should simply read the 2008 Pentagon Report discussing ways to destroy it, or review the Obama administration's unprecedented and rapidly escalating war on whistle-blowers generally. Any rational person would have to acknowledge that government secrecy in rare cases is justifiable and that it's possible for leaks of legitimate secrets to result in serious harm. I'm not aware of a single instance where any leak from WikiLeaks has done so, but it's certainly possible that, at some point, it might. But right now, the scales are tipped so far in the other direction -- toward excessive, all-consuming secrecy -- that the far greater danger comes from allowing that to fester and grow even more. It's not even a close call. Any efforts to subvert that secrecy cult are commendable in the extreme, and nobody is doing that as effectively as WikiLeaks (and their value is not confined to leaking, as they just inspired a serious effort to turn Iceland into a worldwide haven for investigative journalism and anonymous whistle-blowers). This Manning detention -- whether it was by design or just exploited opportunistically -- is being used to depict WikiLeaks as a serious national security threat and associations with it as dangerous and subversive. Just in the last week alone, several people have expressed to me fears that supporting or otherwise enabling WikiLeaks could subject them to liability or worse. There's no reason to believe that's true, but given the powers the U.S. Government claims -- lawless detentions, renditions, assassinations even of American citizens -- that's the climate of intimidation that has been created. This latest incident is clearly being used to impede WikiLeaks' vital function of checking powerful factions and imposing transparency, and for that reason alone, this is an extremely serious case that merits substantial scrutiny, along with genuine skepticism to understand what happened. My one-hour discussion with Lamo last night can be heard by clicking PLAY on the recorders below. It is in two segments (the first roughly 40 minutes, the second roughly 20) because Lamo requested at one point that we go off the record, which we did for 1 minute or so to discuss the parts of Manning's chat that Lamo claims are too personal to publish (Lamo spoke only in generalities about that and I learned nothing specific). The only other part that is edited out is the first two minutes or so of the discussion, before the interview begins, where Lamo for some reason insists that I respond to a Tweet of his before we begin, which I then did. UPDATE: Four relevant items from today: (1) The Washington Post's Jeff Stein reports on Julian Assange's fear of being arrested by U.S. authorities, as well as what appears to be the imminent release by WikiLeaks of a video showing a horrendous U.S. air strike in Afghanistan that killed far more civilians than the U.S. military acknowledged; (2) After interviewing Poulsen, Columbia Journalism Review publishes a timeline reporting that, shortly before Lamo's scheduled May 27 meeting with FBI agents about Manning, Poulsen traveled on that date to Sacramento and "spent a few hours with Lamo"; (3) Judging by this June 10 article, The Washington Post obtained at least some of the Lamo-Manning chats, and quoted parts which Wired has not published -- proving that Wired is withholding more than just "personal issues" and national security secrets; and (4) Gawker's Adrian Chen has an excellent post demanding that Wired provide far more transparency regarding the parts of the Lamo-Manning chats they continue to conceal.